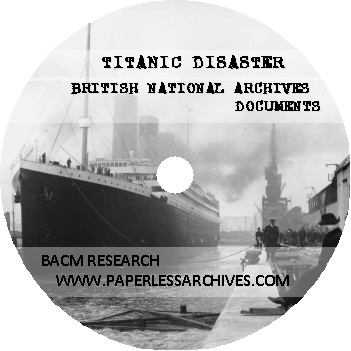 1,175 pages of Titanic Disaster records preserved by the British National Archives. The files date from 1909 to 1925. This collection contains records from British government agencies including the Titanic Board of Enquiry, Board of Trade, Ministry of Transport, Treasury Solicitor, Public Trustee Office, Foreign Office, Cabinet Office, National Savings Committee and Post Office Law Officers' Department. EXT 11/136 Loss of Titanic, Report of the Court of Inquiry into the Loss of the S.S. Titanic. Extracted from Public Record Office serial BT 13/50. BT 334/52 Register of deceased passengers. Includes register for the Titanic disaster. BT 334/53 - Register of deceased seamen. Includes details relating to the Titanic disaster. BT 15/63 List of effects found on deceased crew members of the Titanic. Accounts of wages and effects. Includes correspondences regarding the collection of unpaid wages due to the estate of Titanic crew members who did not survivor the voyage. 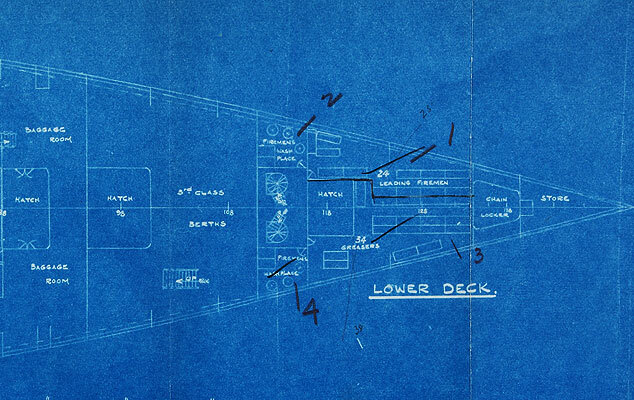 MT 15/504 Blueprints of deck plans for the Olympic and Titanic. MT 9/920/347A Titanic Wreck Enquiry. 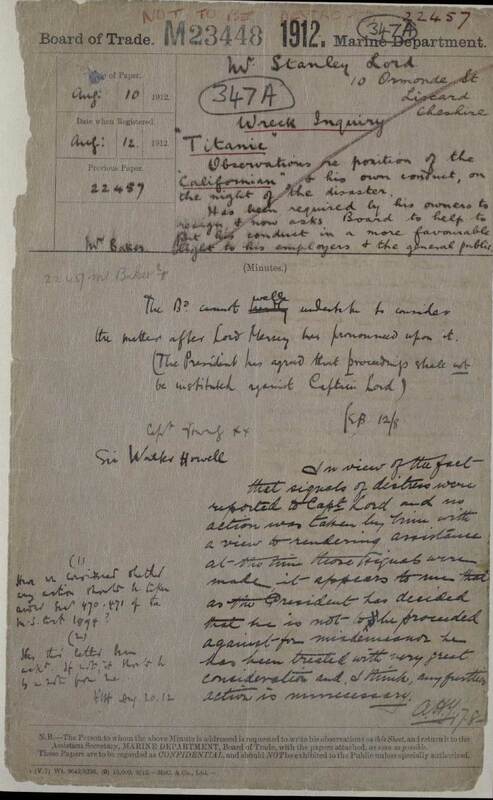 Stanley Lord's observations and the commission's conclusions on the position of the Californian at the time of the sinking of the Titanic, and Lord's conduct that night. Includes a hand written letter by Captain Stanley Lord regarding the night of the wreck of the Titanic. The file notes that Lord was required by his employee to resign and he was asking the Board to help put his conduct in a more favourable light to his employer and the general public. Stanley Lord was the captain of the ship SS Californian, which was in the vicinity of the RMS Titanic on the night of the wreck. MT 9/4469 Enquiry regarding awards of money and medals to members of the Carpathia and details of awards to its captain, A.H. Rostron, for services rendered to survivors of the Titanic. RMS Carpathia was a Cunard Line passenger ship. At 4:00 AM on April 15, 1912, the Carpathia arrived at the scene of the sinking of the Titanic, after navigating through dangerous ice fields, and rescued 705 survivors from Titanic's lifeboats. Captain Rostron was knighted by King George V. United States President Taft presented Rostron with a Congressional Gold Medal at the White House, the highest honor the United States Congress could grant him. TS 27/21 Compensation for dependants of Post Office Officers who died in the loss of SS Titanic. T 1/11470 Payment of compensation to dependants of postal officers who were lost in the wreck of the Titanic. T 1/11444 Public Trustee Office keeping of a record of expenses of the "Titanic Fund" by the Stationery Office. FO 244/801 British Foreign Office correspondences with the German Embassy and Consulates regarding the Titanic disaster and international agreements that followed the disaster. NSC 9/1016 National Savings Committee correspondences related to the administration of payment of widows' grants by the Daily Telegraph "Titanic Relief Fund." CAB 41/33/46 April 16, 1912 memorandum of record from the Cabinet Office of British Prime Minister Herbert Henry Asquith, regarding The Titanic; Coal industry; Government of Ireland Bill; Committee to consider industrial unrest, particularly in transport and distributive trades; and the Welsh Church Bill. CAB 41/33/47 April 25, 1912 memorandum of record from the Cabinet Office of British Prime Minister Herbert Henry Asquith, regarding The Titanic. LO 3/410 Post Office Law Officers' Department opinions regarding the Workmen's Compensation Act 1906 and J.R.J. Smith and B Williamson, deceased servants of the Post Office lost on Titanic. BT 100/249 Registry of Shipping and Seamen: Agreements and Crew Lists, Series III: for the ship Olympic. Covers the journey in March 1912 after which many of the crew of Olympic enlisted on the Titanic. BT 100/156 Registry of Shipping and Seamen: Agreements and Crew Lists, Series III: for the ship Carpathia. Covers the journey in April 1912 when the Carpathia picked up the survivors of Titanic after it sank. BT 27/776/2 List of passengers boarding at Queenstown - List of passengers boarding the Titanic at Queenstown, 1912. Most of these passengers are poor Irish emigrants en route to America, traveling as third class passengers. BT 27/780B List of passengers boarding at Southampton, 1912 - This includes many notable names, including the Countess of Rothes; Benjamin Guggenheim, the American mining millionaire; J Bruce Ismay; and Colonel Gracie, whose book "The Truth about the Titanic" was published in 1913. Also named are a number of aliens representing over twenty nationalities on board. BT 100/259 Lists of crew and passengers, 1912 - This file includes a list of crew leaving Belfast on 6 April 1912, bearing the signatures and rates of pay of individuals; lists of crew (by department) and passengers (by class) lost and saved. BT 100/260 Lists of passengers lost, 1912 - These lists of passengers supposed drowned are arranged by class, and some give addresses. BT 110/426/2 Titanic Registration Document - The copy originally held by the Registrar General of Shipping and Seamen. An endorsement states: "Registry closed 31st May 1912. Vessel wrecked in the Atlantic Ocean 14th April 1912. Certificate of Registry lost with the vessel." BT 350 Registrar General of Shipping and Seamen, 1918-21 - Material from the Registrar General of Shipping and Seamen. Shows the individuals name, date and place of birth, and rating at the time the entry was made. Some give other details such as tattoo marks. Seventy-three of the 211 Titanic Crew members who survived the Titanic disaster have registration information include in this file. Including Frederick Fleet, the lookout man who first saw the iceberg, Master of SS Californian Stanley Lord, the SS Californian was identified in inquests as the "mystery ship," Second Officer Charles Lightoller, and Fifth Officer Harold Lowe. FO 115/1710 Foreign Office correspondence, 1912 - Files show that the British Government was opposed to the United States holding an inquiry into the Titanic disaster, and this file documents their persistent efforts to find legal or diplomatic grounds to prevent it. There was public outcry in the United States after the disaster, and copies of the Congressional Record detail Bills introduced by various Congressmen which would have brought draconian measures to bear against foreign ships in US waters. FO 369/522 Foreign Office correspondence, 1912 - This material is similar to that found in FO 115/1710. There is a great deal of correspondence about the efforts to identify the mystery ship seen from the sinking Titanic and by the SS Mount Temple, and a surprising number of suspects are named. J 54/1548 Litigation on Titanic casualty, 1913 - The British Inquiry cleared Captain Smith and the White Star Line of any negligence in the loss of the Titanic. Then in 1913 Thomas Ryan, an obscure Irish farmer, issued a writ for damages against White Star for the loss of his son Patrick, one of the Third Class casualties. MT 9/920A1 Board of Trade Marine Department correspondence - Highlights include details of wireless messages passing between various ships in the North Atlantic in mid April 1912. House of Commons statements by Horace Bottomley MP, on lifeboats and the question "How far the principal owner [Bruce Ismay] of the vessel should have precedence over a humble emigrant who has paid his fare." Investigation found that over 500 passengers, including women and children, were still on board when Ismay left Titanic in a lifeboat. MT 9/920B Board of Trade Marine Department correspondence - Highlights include an account of a letter written by the SS Californian's carpenter saying that the "Californian did not render help to Titanic although distress signals were observed." Board of Trade regulations and scale of provision of lifeboats and life-saving appliances for emigrant ships. MT 9/920C Board of Trade Marine Department correspondence - Material includes casualty lists, statement from the Master of the Russian SS Birma, wireless message transcripts from the sinking Titanic culminating in the message: "Women and children in boats; cannot last much longer." MT 9/920D Board of Trade Marine Department correspondence - Highlights include, ice warnings, wireless message traffic between ships. A sworn statement of Alfred Fernand Omont, a Titanic First Class passenger boarding at Cherbourg, which conveys the confusion on board after the icebergs impact. MT 9/920E Board of Trade Marine Department correspondence - Highlights include a letter from Stanley Lord to the Board of Trade complaining of the public odium he is suffering and pleading that" something be done to put my conduct on the night in question in a more favorable light to my employers and the general public". A report of the US Court of Inquiry, together with Senator Smith's speech on presenting it to the US Senate, where he blames the disaster on the British Board of Trade, "to whose laxity of regulation and hasty inspection the world is largely indebted for this awful fatality." MT 9/920F Board of Trade Marine Department correspondence - Highlights include a letter to Stanley Lord from W H Baker relating the events that occurred aboard the SS Mount Temple on the night of 14/15 April and calling into question the identification of the Californian as the mystery ship seen from the sinking Titanic. Extracts from the British Inquiry Report of the Court with indications of the action the Board of Trade, castigated by Lord Mersey, thought necessary to update the existing maritime regulations. MT 9/920G 1912 SUBCOMMITTEE OF THE COMMITTEE ON COMMERCE UNITED STATES SENATE - US Inquiry Transcript of Evidence - Proceedings of the US Congress, with a Digest of Testimony. As the Inquiry opened on 19 April 1912, the morning after the Carpathia reached New York, this evidence has an immediacy lacking in the British Inquiry some two weeks later. Includes an account by Arthur Rostron, the captain of the SS Carpathia, of the ship's highspeed trip, navigating though icebergs, to reach the Titanic survivors. MT 9/2922 - Early Titanic films - The British International Pictures production Atlantic of 1929 was based on the sinking of the Titanic. Germany was quick to use the film as anti-British propaganda, claiming that if the ship had been German the disaster would never have happened. The correspondence in this file documents the efforts of the British Chamber of Shipping to enlist the help of the Board of Trade to stop Alfred Hitchcock making a film about the disaster. MT 15/114 - Axel Welin Davits/lifeboat arms proposed for Olympic and Titanic, 1910 - Files include detailed tracings of the davits fitted to Titanic and her sister ship the Olympic. Includes correspondence to the effect that both ships were to be fitted with 32 boats. This would have given capacity for over 2,000 people, significantly greater than the 1,178 that were ultimately provided for. MT 15/142 - Manning of Titanic Lifeboats - This file includes the numeric crew list for 10 April 1912, signed by Edward Smith, the Captain, showing that the Titanic had 892 crew on board for her maiden voyage. Captain Smith was not among the 211 crew survivors. MT15-173 - Bulkheads Committee and Watertight Compartments Committee wreck investigation correspondence and papers. MT15-212 - Engineer and Surveyor inspection reports, correspondences, memorandums, and diagrams. House of Commons Parliamentary Papers 1914 Vol. LXX. - International Conference on the Safety of Life at Sea, 1914 - The conference, recommended in the final paragraph of the Report of the British Inquiry, convened in 1913 to consider the subdivision of ships, lifeboat provision, wireless telegraphy, the reduction of speed in the vicinity of ice, and the use of searchlights.